Collecting Antique Clocks: The Longcase Clocks of Thomas Power of Wellingborough. Thomas Power is a name known only in recent years to those devoted to the study of early provincial clockmaking, but it is one of those names which instantly whets the appetite, as we who know his work have come to expect his clocks to be fine things of an interesting nature. He was a maker who was a pioneer in his area (Wellingborough in Northamptonshire), who did things just as finely as the London makers of the day, yet who thought for himself instead of slavishly following accepted patterns and procedures. In fact it was only a few years ago that he was believed to be a London maker, based on the quality of his work and the fact that an occasional clock of his was signed without a placename. In those days those who wrote about clocks assumed everything fine must have come from London, as knowledge of provincial clockmakers and clockmaking barely existed. We have come to expect there will always be something about a clock by this maker that will bring a smile to a collector's face, a lovely maker, whose work gives us immense pleasure. His work often incorporates features that we collectors love to see, things we delight in because they are distinctively and individually different, and which set men like Thomas Power apart from the mediocre - exquisite engraving, superb hands, latched pillars, finned pillars, innovative construction or layout. I wrote about his lantern clocks not long ago (Clocks Magazine for November 2003), where I listed those I knew about. Since then a further one has come to light, which makes a total of eight lantern clocks known to me. The discovery of a 'new' longcase clock by him recently (the second in this sequence) prompted me to write now about his longcase clocks and illustrate a few features of them. I myself know of four longcase clocks by him. Of course, there will be others, but even from just four, we can see what sort of job he made of clockmaking, as one of the very first to take up the craft in the county of Northamptonshire. He was born about 1630 and died in 1709, and we believe he was working in Wellingborough by the 1660s. 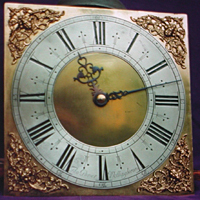 Number one and the earliest is a beautiful single-handed thirty-hour clock with tulip-engraved dial centre and corners pictured and described in detail in the book 'English Thirty-hour Clocks' by Jeff Darken and John Hooper published in 1997, and illustrations of that clock are reproduced here with their consent. This clock has an quite outstanding dial using the sort of all-over tulip engraving we would more usually expect to see on a lantern clock. Longcase dials with this sort of engraving are very uncommon and limited to the very earliest longcase clocks made between 1665 and the later 1680s. The authors date this one to about 1675. It is the only longcase clock of Power's that I know where he has used this flowery form of signature 'Tho: Power de Wellingborow Hoc Fabricavit', meaning 'Thomas Power of Wellingborough made this', though he did use that form on his earlier lantern clocks. This sort of signature displays a touch of vanity, a showing off of pride in his work and in his schoolboy Latin, and is most usual in the earlier working years of a clockmaker, who later in life would usually learn to blow his own trumpet a little more quietly. We have no knowledge of the case of this first clock. The second clock is a two-handed thirty-hour clock with a ten-inch dial and is signed 'Tho: Power Wellingborow'. I would think this examples dates from the early 1690s. It is the only one which has its bell mounted vertically, a method found only on very early clocks. The dial centre is finely matted, as was the general fashion (led by London of course) and the corner spandrels are the usual cherub heads of the late seventeenth century. The oak case of this clock was clearly purpose-made for it, but appears to date from the mid eighteenth century, and therefore must be a later replacement. 1. The dial of the earliest of these clocks, a single-handed thirty-hour, is engraved all over and signed 'Tho: Power de Wellingborow Hoc Fabricavit' (Thomas Power of Wellingborough made this) and dates from about 1675. Fine original hand. (picture copyright Jeff Darken). Click for closer view. 2. 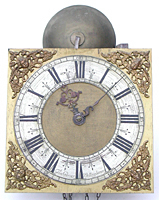 The ten-inch dial of the second clock in the sequence, a two-handed thirty-hour dating from perhaps 1690 signed 'Tho: Power Wellingborow', has a matted centre and cherub head spandrels and fine original hands. Click for closer view. The third clock is also a two-handed thirty-hour clock and also signed 'Tho: Power Wellingborow', with a most unusual polished centre to the eleven-inch dial, again with typical cherub head spandrels. I can only recall seeing this sort of polished dial centre once before in a clock of this kind of age, and that was on a longcase clock by Henry Simcock, himself a fine craftsman working at Daventry, also in Northamptonshire and only about twenty miles west from where Thomas Power worked at Wellingborough. Simcock worked there from about 1690, by which time Thomas Power would have been sixty years old or so, so I imagine it was Simcock who copied that idea from Power rather than the other way round. Thomas Power was a first-rate craftsman, capable of anything his trade called on him to do, and in the 1690s, when this clock was made and when he was already an old dog, I doubt you could have taught him any new tricks. The frontplates of many clocks were left unfinished, probably because they would never be on show. In this instance Power has finished the frontplate off by filing and polishing just the outer edge area, almost certainly for the purpose of getting a flat surface where his latches needed to swing. His earlier clocks however seem to have had fully finished frontplates, and so does the one later one we have pictures of. Was he perhaps cutting corners on this third example? This clock is housed in a case of ebonised pine. The fourth clock is an eight-day, a fine clock in a very grand case of walnut veneer and the finest one I know by this maker. This too is signed 'Tho: Power Wellingborow' and has a matted centre with twin cherub spandrels, a design which follows on after the cherub head type and was used from about 1695 to about 1715. This clock probably dates from about 1700. 3. Movement frontplate of this clock showing the latches, now of a larger size and stronger than before. Click for closer view. 4. The eleven-inch dial of the third clock in the sequence, a two-handed thirty-hour clock signed 'Tho: Power Wellingborow' and dating from the later 1690s, has an unusual polished dial centre and fine original hands. Click for closer view. Thomas Power did certain things consistently, partly as a sign of his craftsmanship and partly because they were recognised as the best way to do things at the time. He fastened all his movement pillars at the front with latches, something the best London makers did, the idea being it made assembly and dismantling easier. Pressing a latch into position to hold the plate fast can be done with one hand, whereas knocking a pin into place needs two. The latches seem to keep varying in shape, those on his earliest clock being daintier, as were those on his eight-day clock, whereas the other two thirty-hour clocks had somewhat heavier latches. Was it just that he got bored with making them all the same? He positioned his bellstand on the frontplate on each of these clocks. Attaching to the frontplate is said by some to be a sign of an early clock. I have never particularly thought much of this view, as we see a number of early clocks with backplate bellstands. It seems to have become regular practice to set the stand on the backplate on later (perhaps post 1750) clocks, probably because it is much easier to get at there to tighten the holding screw if it comes loose. Thomas Power liked his bellstand at the front, perhaps because there it was out of the way of the locking plate strikework outside the backplate, and kept the backplate a bit less cluttered. There were other things that he did inconsistently, probably because he was constantly experimenting with mechanical variations. His earliest clock has the strikework arbors made from square-section iron, like a lantern clock. His three later clocks have rounded strike arbors. He kept changing his hammer spring both in its position of attachment and in its length. Perhaps he was just constantly experimenting. Power died in 1709 aged about seventy nine. We can guess from his inventory, and that of his widow, Sarah, who died only a couple of months later, that he was one of those clockmakers who did pretty well everything 'in house'. We need to consider the contents based on both inventories, because inventory takers use to lie a little to be kind to those inheriting, and a surprising number of clocks and parts of clock were left when Sarah died that seem to have been 'overlooked' when Thomas died. The various clocks left unsold at his death included: a 'spring clock and case' (we would today call it a bracket clock), then two 'old spring cases' (cases for bracket clocks), three weatherglass frames (indicating he also made barometers), 'one ingin' (a wheel-cutting engine indicating that he cut his own wheels), '4 brass watches' (implying that he also made watches), roasting jacks, the dial for a church clock, implying he also made turret clocks. 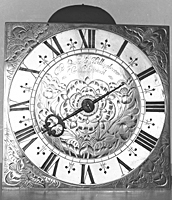 Only a few years ago a provincial clockmaker of this period would not have been given credit for making clocks such as spring clocks, as it was then assumed that provincial makers bought them in from London and retailed them with their own name on. Now we know differently. It is uncommon to find an inventory of the working tools and stock of a clockmaker of this early period, and what we find is most interesting, but not altogether unexpected. From what we know of his work we would expect Thomas Power to be a craftsman of the highest order, capable of undertaking personally those separate aspects of his trade, which lesser men would have farmed out to specialists. We can see from the way he finished his clockwork with fancy flourishes and extra little touches, that he took great pride and pleasure in his work, and today's collector who recognises such things, can share that delight in work well done.